The ASVAB is the Armed Services Vocational Aptitude Battery and it is a test a person takes when they are considering joining the military. This test determines what job an applicant may be suited for and if the required minimum aptitude is met. It’s an aptitude test that will determine your strengths and which careers you’re best suited. There are three versions of the test, a computer adaptive version called the CAT-ASVAB, a written version called the MET-site ASVAB, and the Student ASVAB. The CAT and MET are used for enlistment into the armed forces. The Student version results are used to help students and school counselors explore careers and occupations or even college majors. The Student version can also be used to enlist. So what is on the ASVAB? All three versions of the test contain math, verbal and mechanical aptitude components. The test is broken out into 8 to 9 sections depending on the version of the test. Topics include solving basic math problems, knowledge of science, vocabulary, math concepts, electronics, automotive repairs, metal and wood shop, and principles of mechanics. Get Your ASVABWhat kind of grade do I receive? You receive a percentage grade. Your score is a % measurement against all those that have taken the test. This % score is known as the Armed Forces Qualification Test (AFQT). The Armed Forces Qualifications Test (AFQT) is calculated from four sections of the ASVAB: two math related, the Arithmetic Reasoning section and the Mathematics Knowledge section, and two verbal sections, the Paragraph Comprehension section and the Word Knowledge section. AFQT scores are reported as percentiles between 1-99. How is the test score calculated? 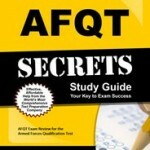 An AFQT percentile score shows how you did compared to others that take the test. If you score a 50% it means you scored as well or better than 50% of test takers. Of note, these scores use a baseline of a sample of 18 to 23 year olds that took the test back in 1997. Does my score really matter? Yes. The score can qualify you or disqualify you for military service. Each branch has a minimum score. The Navy requires at least a 35, The Marines and Army a 31. The Coast Guard requires a 45, and the Air Force requires a 55. It is probably not a bad idea to prep for the test. There are many guides around, check out amazon.com or your local bookstore. ASVAB Study GuideCan I retake the test? Once in the service you may be able to retake the test. The Navy recently came out with a program. A sailor that wants to change jobs in the Navy can retake the test. A higher score can open up a lot of new opportunities. The retest is known as the Armed Forces Classification Test, and it has the same topics as the ASVAB. A sailor must get approval from their commanding officer to take the test. To prep for the test the Navy has an academic prep program to help boast math and reading skills.